Kilncare Hobbyfuser kilns are in stock for immediate delivery or collection from Bristol. The Hobbyfuser 3 is the latest generation in this serious glass kiln. The Hobby Fuser 3 is designed for for glass fusing, slumping, casting, paint and stain. A practical piece of studio equipment with a smart look in brushed stainless steel. Choose to add a shelf kit and/or a powder coated stand to kit out your studio. Creative Glass Guild offer Free Delivery to UK mainland addresses. (excluding some remote and highland areas). Get upgraded to our 10% Discount Band for 12 months! Purchasing the Hobby Fuser kiln through Creative Glass Guild will add to your annual spend on our discount scheme. Plus, get a £50 voucher to use against System 96 glass to get you started in glass fusing (valid for 12 months). The kiln is built for a long life span and comes with a 3 year guarantee on all parts including the elements. We can recommend the Hobby Fuser kiln personally, as we have two of our own. Our experience has been excellent and our team are very familiar with the kiln and it's controller. Purchasing through us, you will have the benefit of our extensive experience should you ever need it. 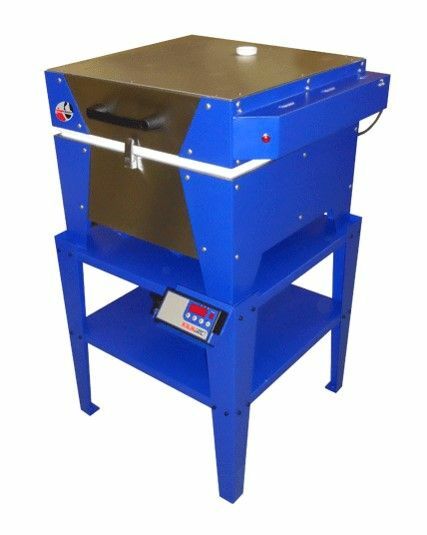 The Hobbyfuser 3 is fitted with high performance, infra-red quartz elements and well designed insulation, the kiln will make the important 700c to 800c rapid heat at a rate of nearly 450 degrees per hour even with the optional shelf installed. That is only 11 minutes and if a shelf is not used then that same process can be made in an incredible 9 minutes. This makes the Hobbyfuser almost infinately controlable ensuring the glass doesn't get "over-worked" by it being in the heat longer than is required. The new 2014 Hobbyfuser has a distinct new feature. 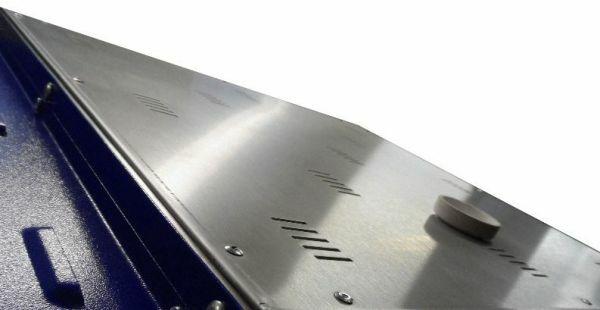 - a brushed stainless steel shell, plus as with the previous model, the lifting and closing of the lid is now a single finger operation thanks to a pair of specifically manufactured and designed Stainless Steel coil springs at the rear of the kiln. However, if you decide to use more than the one finger, there are now two handles for left or right hand lifting. The 2012 Hobbyfuser also has a new catch to hold the lid closed. 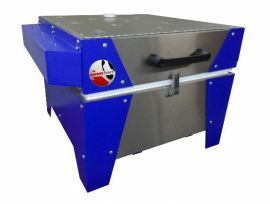 The kiln lid is made from stainless steel and lined with non-ceramic fibre, press cut and fitted with the use of a hydraulic compressing machine, in a quite unique way for kilns of this type. This method of insulation removes the danger of brick dust or particles dropping onto the glass, so making for a very clean firing environment. It also makes the Hobbyfuser incredibly resistant to shock damage. This lid construction enables the Hobby fuser to hold back the heat when needed but still release heat rapidly during the all important cooldown period. In the centre of the lid is a vent hole which comes with a matching plug. This is positioned to the rear of the chamber to avoid particle contamination on the glass. The kiln's heating system is in the roof only and utilises the latest technology "infra-red" quartz tube heating elements. This method is extremely hard wearing and strong, yet in the event of an element failure the tubes are both easy and cheap to replace. The elements are switched off when the lid is opened by an automatic safety switch. The base section of the chamber is made from refractory brick and made in such a way that the bricks can be easily replaced without the need for cement etc. With only approximately 2 thirds of the available height being in the base it means that access to the floor is not restricted by high walls. The pre-fitted control is the KCR2 controller. It has 9 programs, each having 9 segments. each segment consists of 1 x rate of climb, 1 x target temperature and 1 x dwell/hold. Each one of the 9 KCR2 programs is pre-set with useful glass cycles for fusing and slumping System 96 fusing glass as well as a Bottle slumping program and a couple of stain cycles all developed in association with Creative Glass Guild's team. If these programs are not as you would like them, simply alter them to your own preferences. The KCR2 gets its data from a new ultra-fast response, stainless steel thermocouple meaning no lag between the kiln temperature and the KCR2s control. The fact that the thermocouple is stainless steel means it is also reiliaent to accidental damage. The Hobbyfuser comes complete with a 13 amp plug top and fully complies to all European and CE requirements. Built in the UK, in Stoke on Trent, parts and service will never be an issue. Call us if you would like any further help with your choice on 0117 9588820. We endeavour to keep these kilns in stock for immediate delivery, in the event we do not have stock on hand, delivery can take up to 5 weeks depending on factory workload. Please read the delivery information sheet for the Hobby Fuser kiln which will be attached to your e-mailed order confirmation at the time of purchase. This is really a great kiln. Why? What makes it a great kiln? 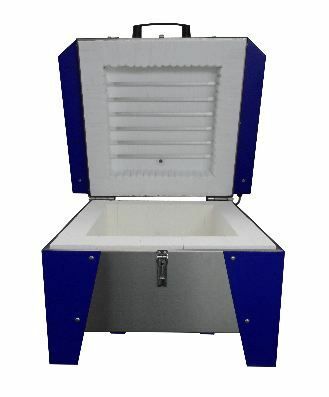 The capacity for one, large enough to hold nine coasters or several bowls depending on mold size. An even consistent heat, mine has no hot or cool spots so its an even fuse every time. Very economical to run, despite running mine two or three times a week at various cycles there isn't a noticeable increase in our electricity bill. What about the actual kiln? Well if you choose the stand option the kiln is at great working height. Not too high or too low and for someone with back problems this is a real boon. The lid is huge and heavy but thanks to the hinges and the dual handles it as easy as opening a standard kitchen cupboard door. This is a solid kiln, built to last. Great value for money the best thing? The service from Kilncare is beyond exceptional. Mine arrived just before Christmas I had a question so emailed the comapny in rush for a reply. The chap phoned me from his home on Boxing day. If that isn't exceptional service I don't know what is. Having hired kilns at creative glass guild for many years i decided i needed my own - the hobby fuser is a perfect first kiln as it is sizable enough to make large bowls, doesn't cost much to run, and will fit into your space easily without any need to be wired in. I have had mine for about 7 years and have had no issues so far - touch wood for next firing!! Solidly built, easy to programme, plugs into the mains and is relatively compact. I have always had consistent results with this kiln and would highly recommend it as a starter kiln. This is my secondry kiln but I'm afraid it will be used as much as my other kiln . This is a robust 1st class kiln . Easy to use ready programed is a bonus . Great service during ordering, delivery and aftercare, from kilncare and CGG. Pre programmed control unit really did mean I could plug it in and go! I've used it twice a week for the first 2 months I've owned it, it been super reliable and I have utter faith in it. I also have complete faith that when it needs servicing it will be easy to organise. Awesome first kiln! Being a pernickety sort, when I decided to get a kiln I did an awful lot of hemming and hawwing when I did my research. I wanted a kiln that was consistent, a decent size, reliable and cheap to run. The main things I wanted to do were glass painting and fusing – perhaps a bit of slumping (never tried it before) but the option to give it a go was important. You’d never know if you were a slumping wizard unless you had the tools to give it a go (I’m not, but that’s not important right now). The Hobbyfuser 3 seemed to fit the bill and one of the things that persuaded me was that Creative Glass Guild said that they used a couple in their studio. If they use it – it’s gotta be good – right?! Was it consistent? YES – no hot spots that I’ve identified (and I’ve been busy – done about 40 firings thus far) and great results. You can store 9 programmes in the controller so, now I’ve done all my test firings, I just need to pick the right programme and away I go. Would I be a little over confident to say that I know what results I’m going to get before everything’s cooked? Probably but I can almost certainly discount kiln issues as the cause. Human error – that’s a different matter – in my case, those are frequent and frustrating but I can’t blame my tools. Decent size? Indeed – I can get 9 coasters in or masses of pendants if that’s my menu for the day. If I’m feeling adventurous I can fire a glass painting up to 37cm square (a centimetre smaller than the shelf). There’s plenty of height to indulge in a bit of slumping too (if you’ll pardon the oxymoron). Reliable? See consistent! Yes – what can I say – hasn’t let me down yet and I haven’t even had to speak soft words into it’s kilny ear. I have given it a name though (Big Bertha if you want to know). One of the things I looked for was how expensive it would be to repair if that became a neccessity – the Hobbyfuser 3 has elements you can switch in and out easily and you can also replace the bricks without cementing. Simples. Cheap to run? Again, it’s a yes. The newfangled "infra-red" quartz tube heating elements must be quite energy efficient as I haven’t noticed an uplift in our electricity bill at all (well, not to do with the kiln anyway). Top loading rocks – especially if you are fusing – you can see exactly what you are doing. Kiln paper – treat it kindly and it will last several firings. Controller – wow – scary to begin with and then quickly becomes laughably easy to understand. In summation – if you need a decently sized, reliable and cheap to run kiln, the Hobbyfuser 3 is the bees knees. After careful consideration, I took the plunge and bought myself a Hobbyfuser 3 Glass kiln. And why not! It is absolutely brilliant. The controller is so easy to use, and comes pre programmed with great options. I've slumped in it, done hot firings, even done a pot melt in it (using a split pot melt mould from Creative Glass), and that went really hot! It's a good size and is ideal for a starter kiln. It is British built, and has been made to a very high standard. Another plus is that is comes with a 3 year guarantee and free delivery. You won't regret choosing this kiln, you really won't. I've had my Hobbyfuser for around 8 years now, and remember I had excellent delivery and advice from CGG. James even programmed my control panel which I've used ever since! Although I had a good few years out not using it, I fired it up a few months ago to do my first piece of fusing - there were no problems and I was pleased with the result. Very good and reliable kiln and worth the investment to be able to hot glass when you like!